Zombie digital painting tutorial. Here is another how to draw and paint zombie video and step by step digital painting tutorial instruction. I had no idea that Zombies are so much fun to draw and paint until recently. You pretty much can add or subtract what you prefer from basic human anatomy to fit your liking. Personally, I like Zombies’ version from 28 days later. But recently, I have to admit that the slow moving ghouls are a lot more appealing as I envision them more. Romero’s Zombies rule! But before Romero’s Zombies was inspired by The 1954 publication of Richard Matheson’s “I Am Legend.” It is the story of a future Los Angeles, overrun with undead bloodsucking beings. Notable as influential on the zombie genre is the portrayal of a worldwide apocalypse due to the infestation, in addition to the initial conception of vampirism as a disease (a scenario comparable to recent zombie media such as Resident Evil). Anyway, like art, certain subject has appeal that inspires people to further develop or adopt the genre (I not sure what I was trying to say). Now I am reading the book called “The Zombie Survival Guide: Complete Protection from the Living Dead” by Max Brook. It is very interesting and has a lot of great information, but I think the author takes his subject very serious. Well, you never know, we often fantasize about the apocalypse since the dawn of mankind. Who knows how we will end up, but we certainly know why. Our kind are very destructive, and eventually might spiral into self destruction. Unless enough people have the will power to fix or undo what we’ve been doing wrong. Wow, that was quite a serious paragraph, considering this is a drawing and painting blog. Any way, below are the recent Zombie dude I did. Here is a final zombie drawing with color. Watch the video how to draw and paint zombie. Below are step by step images to guide you along with the art video tutorial. Step 1, I start out with a rough shape of a zombie body with pose. At this stage, it is very scribble because I just want motion and shape to go off from that I can draw over later. Step 2, now I know what its pose will be so I draw a cleaner line with face and zombie’s outfit. Step 3, once I have the drawing figured out, I can now shade in gray value onto the figure so I can paint it over afterward. Watch the video tutorial for more comprehensive instruction in detail. 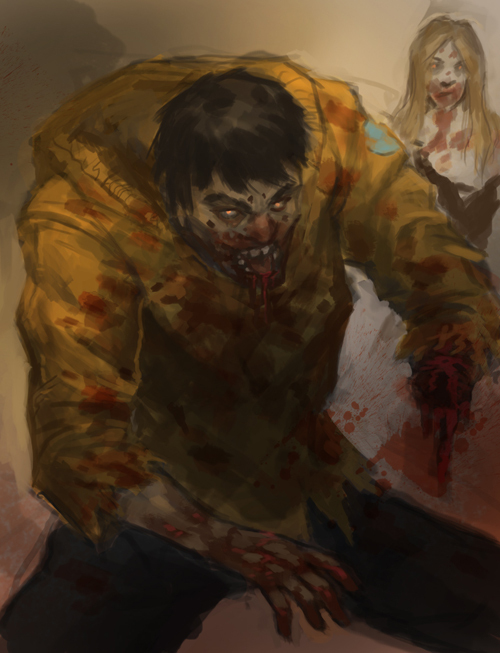 Below are step by step how to paint over zombie drawing for illustration. No problem, glad it can help. Peace!